Some of our fondest memories from our journey were from our visit with Maggie Doyne and her children in Surkhet, Nepal. All the kids were such a joy to be around. 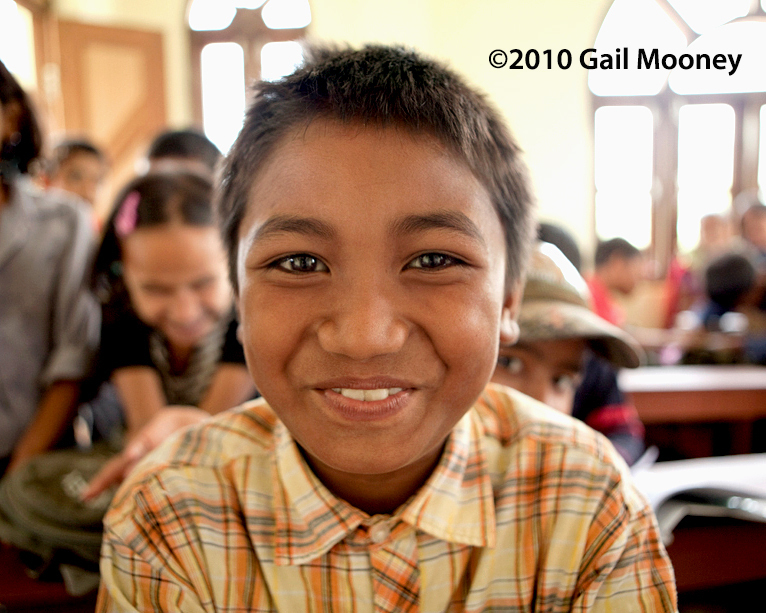 This young boy at the Kopila Valley Primary School glowed with enthusiasm. small hill tribe village in the northern mountains of Thailand. 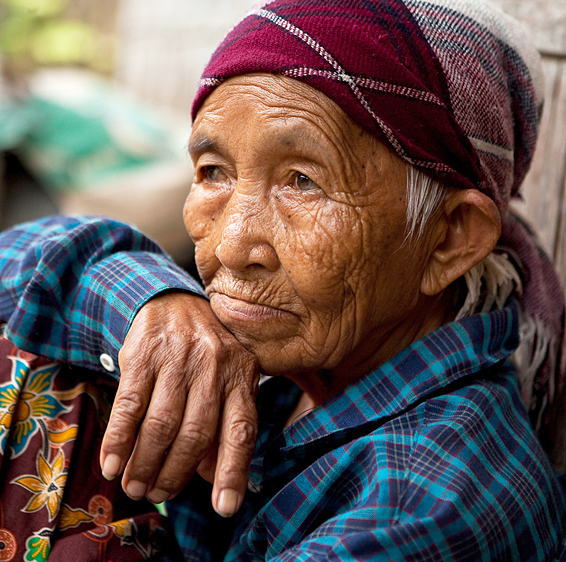 We were following Dr. David Mar Naw, as he trekked through the villages, a “one man band”, dispensing medical care and building latrines for Burmese refugees. Some of them had never seen a doctor before. This lady was waiting to have her tooth pulled. It was painful to watch as the doctor pulled this woman’s tooth, without anything to ease her pain. She was stoic and barely winced. Perhaps she was thinking about the relief she would have, after the tooth was removed. These people humbled me, in fact I was humbled by all the people we met, along our journey around the world. I will be forever grateful for that journey. It opened my eyes to so many things and I am a better person because of it. This is just one story that makes up the film, Opening Our Eyes, a documentary about the “power of one” and “making a difference” in the the world. When Erin and I set out to make a film about ordinary individuals who were doing extraordinary things to make our world a better place, we didn’t know we would be meeting the real heroes of our world. Each one of the people in our film is doing something that is not only courageous, but some would say, they are doing the impossible. I suppose we could have chosen more high profile people or celebrities, but we opted to shine a light on the folks most people haven’t even heard of. That was a deliberate decision because we wanted to show what the individual is capable of. As I watch the footage of Hurricane Sandy’s aftermath, I’m reminded of the power of the individual. I heard story after story about regular people who had put aside their own comfort and safety to go to the aid of others who were less fortunate. These stories will fade in our memories as time goes by, but my hope is that people will take notice and think about their own actions. It’s easy to get caught up in the hype and glitz of the world we live in, paying homage to the notables, and the large entities that have the power and money to make the biggest splash in the news. And we talk ourselves out of the little actions that we could take, telling ourselves that we could never measure up. How sad. Maybe that’s the downside of the culture we live in. I can only hope that more people will take notice of the ordinary people and the efforts they make – not for money – not for recognition – but simply because it’s the right thing to do. We created this film to move people to action. The actions don’t have to be huge. They could be helping a child with their homework, walking a neighbor’s dog who isn’t able to do that for herself or just listening to someone who needs a person to talk to. We don’t have to be a celebrity, have a big name or have lots of money. We just have to realize that sometimes it’s the little things we do that count and all those little things add up to make our world a better place. Imagine if everyone did one small thing to make a difference. I saw the movie “I Am” last night. I had been wanting to see it for some time because someone had told me that it carried the same message as Opening Our Eyes. 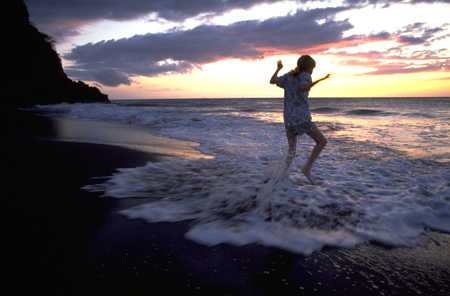 In fact, in one of the interviews in the film, a subject states numerous times the phrase “the power of one” – the power each one of us has in their actions and their thoughts. The documentary, written and narrated by Tom Shadyac, Hollywood director known for movies like Ace Ventura and Liar Liar, questions “what’s wrong with our world?” Are aggression and competition really the natural order or is there a better way? Are we happier when we win? Are we happier when we have more? Does it make us feel better to beat out the other guy? The film goes on to show that what humans really need is to connect with other humans and be loved. Everything on our planet is connected through energy and the human mind plays a powerful force in either working toward a collective goal of harmony or selfish isolation. And that each one of us has a huge impact through our small actions that make our world what it is and how we interact with one another. No doubt many will see this film as an idealistic quest for utopia. They’ll cry – it’s an unattainable dream because there will always be the opportunists who will seize control for their own gain. Perhaps they may be right, but does that mean that we should stop caring for our fellow man and striving for a better future for our planet? I spent the most rewarding summer of my life last year, around people who were living a fulfilling life by making a difference in the lives of others. They lived rich lives of peace and contentment. Some of us go to a church, synagogue, mosque or some other place of worship for an hour or two each week and feel good doing it. But then we spend the rest of our week, interacting with people in all sorts of ways contrary to the preachings that we had taken to heart just a few days prior. Sometimes, I think religions do more harm than good as far as “connecting” humans, by creating congregations that are too insular at the exclusion and detriment of others. Ultimately, this never breeds good will and will never lead to utopia. In the film, the question is asked “who is responsible for what’s wrong with world?” One person replies “I am.” I can echo that and say I am responsible too. Every little thing I do can make a difference one way or another in someone else’s life. I try to remind myself of that daily in my dealings with people. I have found that when I love fully, without any expectations in return, I am at peace and only then can I be loved. It’s hard to believe that it has been 25 years, today, since you were born. My life changed that day I became your mother, in thousands of meaningful ways. I cannot have imagined how life would have been without you in it. I’m sure every parent reading this understands how profoundly life changes when they become a parent – and for the good. The biggest change for me is that I became less selfish. I had to consider that my actions not only affected just me anymore. Of course couples should think like that anyway if they want to have a good relationship – but it’s a different type of selfless care when it comes to your child. Today is another milestone. It was two years ago that we started our journey together as far as this project. 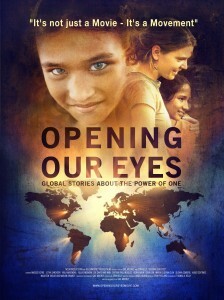 We officially launched the Opening Our Eyes blog on Jan. 5, 2010. Five months later we embarked on our travels around the world. We not only completed the journey – we have completed a film. A film that I hope will inspire others to do whatever small acts – or large acts – they can that can make our planet a better place. It seems fitting that at midnight tonight our campaign on IndieGoGo is over – bringing this blog and project full circle. I never would have imagined 25 years ago that we would have experienced such a wonderful and amazing project together. But we did and we will have that connection for an eternity. But to be honest, I value every other little moments in our lives that we’ve spent together just as priceless. This was a remark that someone made to me after the screening of Opening Our Eyes the other evening in Seattle. It was probably the nicest thing that anyone has said to me since I’ve been screening this film. Most of you who have been reading this blog know that this film was created by my daughter Erin and I during our 99 days in the field on six continents while making this movie. We had a lot of “together time” and that was the best part of the experience. Our little two-person crews was able to work on a shoe-string budget made up of airline miles, hotel rewards and trades for gear and services. and create a 76 minute documentary. During the Q & A after the screening, one attendee asked about the financing of the film. I told her that even though the shoot part of the production was financed with airline and hotel points and trades, there were still the costs of visas, vaccinations, and all the post-productions costs of editing, sound mixing, music rights and stock footage. When all was said and done, including buying the gear, it was just under $50,000 – and that doesn’t include film festival submissions, PR and marketing etc. going forward. I did raise $10,000 on Kickstarter and we are currently running a funding campaign on IndieGoGo, but where did the other money come from? I answered her questions by telling her that when my mom died in 2004, she had left me a little money. I had never spent a penny of it until we began this project, when I set up a separate LLC, Nola Productions, named after my mother and placed my inheritance into that. I think my mom would not only be proud of me, but also her granddaughter, my daughter, Erin. 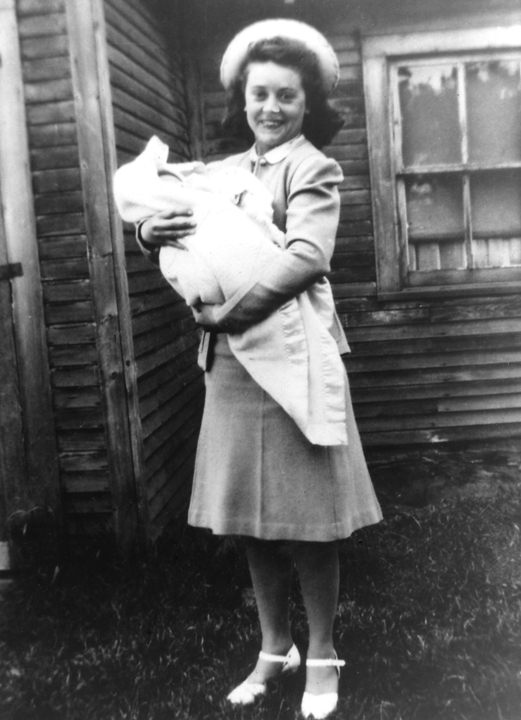 My mother always thought of others and their needs first – before she thought of her own needs. She taught me to think about how my actions could affect others. She also taught me to believe in myself and encouraged me to follow my dreams. She gave me everything I needed to accomplish this film – the courage to take action on my dreams and the means to make that happen. I think she would be proud of what I chose to do in her name. I just received some fabulous news. That is that the San Francisco Film Society has agreed to be a fiscal sponsor for Opening Our Eyes. This is huge because it means that we can apply for grants and accept donations under their 501C umbrella. I would be remiss if I did not thank my husband, partner and best friend, Tom Kelly for filling out the application and providing the reams of necessary documents. He really came through for us and I can’t thank him enough. It’s been very challenging, raising money for film festival entries, setting up theatrical screenings and promoting the film. But what would be the point of our team’s tremendous efforts in making this film if it ends up being the best kept secret? I truly hope that this this sponsorship and 501C status will encourage individuals, institutions and corporations to donate to Opening Our Eyes so that we may realize our goal and inspire and motivate others as to what they can do to make our world a better place. The San Francisco Film Society is one of the oldest and most respected film groups in the United States and to get this distinction is truly an honor. We have been so blessed by so many people who have believed in our project and have either contributed money, their expertise or both. I can’t even begin to express how meaningful this experience has been and how it has changed my life in so many ways. Quite simply it has given me hope – at a time when there is much hopelessness and despair. Please help us get this film out there. If you are involved with foundations or work at corporations that give, please pass along the link to our project. You never know what may transpire and hopefully this has made things a bit easier. All donations are tax deductible. Every one of our subjects and their causes will win if this film gets noticed globally. It is off to a good start with the trailer being seen in over 114 countries – but we have a lot of work ahead. I can do a lot of things on my own – and have – but I need everybody’s help on this one. It’s not just a movie, it’s a movement. This is more of an announcement or unveiling as opposed to a blog. Drum roll please – our new “one sheet” or commonly referred to as movie poster. I was extremely fortunate to have digital artist Allan Davey create the poster. I am simply amazed by Allan’s talents. Most of you have probably seen Allan’s work on many book covers. Like so many other serendipitous things that have happened since embarking on this project, Allan came into my life and wanted to be a part of what we are doing with this film. He wanted to contribute and indeed he did. I am in awe of Allan’s talents and am very grateful for his beautiful artwork. Please contribute to our campaign on IndieGoGo and pass the link along to your friends. You’ll be helping us to grow this movement and create a shift in our culture about what we can do for others. Yesterday morning, Opening Our Eyes was screened for the first time. It was perfect in every way. The night before the screening, Erin, Tom and I and our friend and executive producer, Angel Burns went down to the theater to take some pictures of it. 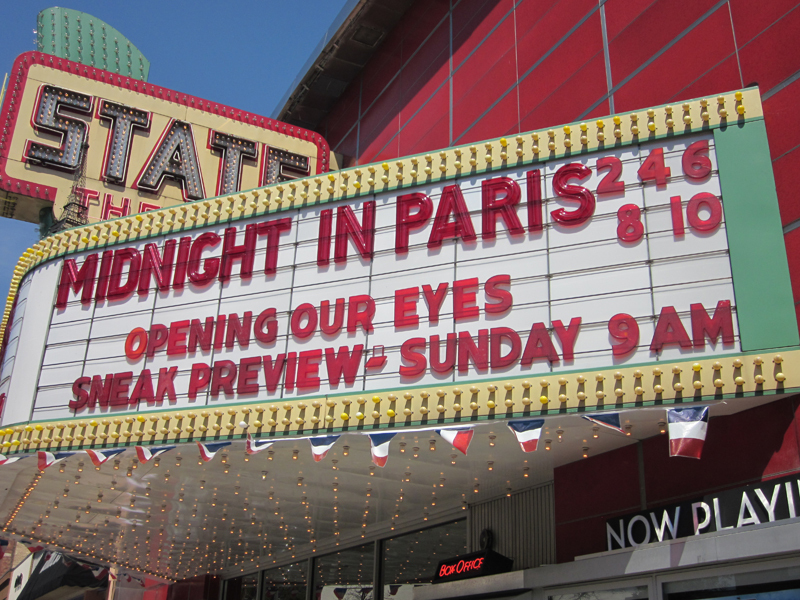 There it was on the marquee – right under MIDNIGHT IN PARIS – OPENING OUR EYES– A SNEAK PREVIEW – SUNDAY 9AM. There it was, sharing the billing with one of my favorite recent films. 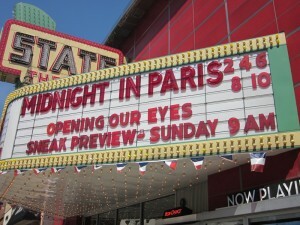 Night theater ErinMVI_0178 As soon as the 10 o’clock showing of Midnight in Paris went in – a 3-man crew started taking down the letters and putting up new ones. It took them some time but letter by letter up it went. But it was when they started putting up our names that an incredible feeling went through my body. I had done it. I did what I set out to do. The next morning, I was full of nerves. It has been a long time coming and the day had arrived. My Aunt Ike and cousin Rene had spread the word through town amongst friends, family, co-workers. There was a family reunion also planned that weekend and all those people had come. Angel was outside talking to folks who were looking at the poster of what was playing at the upcoming Traverse City Film Festival next week, and invited them. All in all, I think there were about 150-175 people – not bad for a Sunday morning in a town with a lot going on. 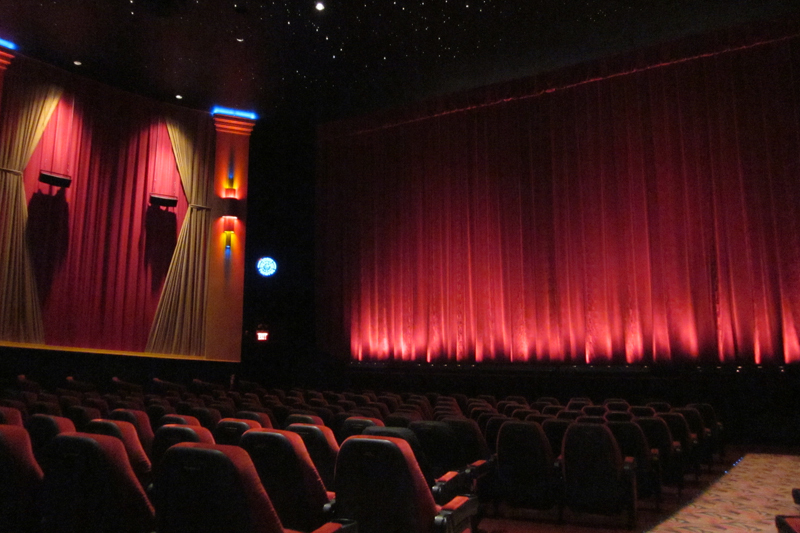 As the curtain went up – yes, a beautiful classic red curtain -and the movie began, it was almost surreal. Even though I had seen this film a hundred times – it was the first time I watched it as a movie – with popcorn and all. But I think the best part was the Q&A when a man stood up to ask a question. He said “Thank you for making this film. It has changed my life”. He had been someone Angel had talked to outside. He hadn’t even intended to go see a movie that morning. That was a big moment for me. On to Detroit on Thursday, for our next sneak preview. It won’t be as grand as the first screening – because the first one’s are always the most special – but our two subjects Marian and Maureen will be there. Can’t wait.